When it comes to home remodeling projects, Houzz and Pinterest are endlessly wonderful resources. Unless you have an endless renovation budget, though, it’s usually a prudent idea to find less permanent ways to get the look you love that’s causing a buzz. After all, your floors are the literal foundation of your home. One year later after your remodeling project is complete, it will always be easier (and cheaper) to deal with regret over furry, ochre throw pillows than face the sickening reality that you no longer adore your downstairs bathroom’s trendy, orange Moroccan tile floors. 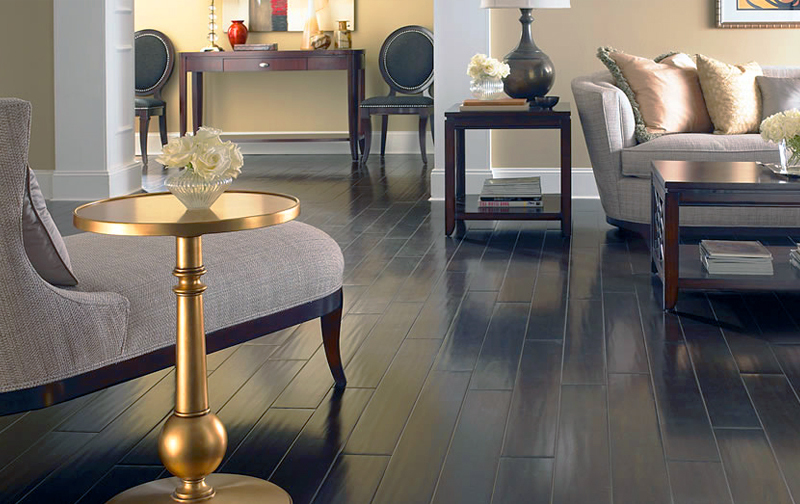 Buying new floors is a significant investment that will shape the look of your home for years, but that doesn’t mean you have to compromise and choose flooring that isn’t stylish. It’s all about finding the right balance. Interior design trends come and go, which is why—when choosing new floors—it helps to figure out which looks are your best bets for adding long-term resale value to your home. Narrow strips aren’t nearly as popular as they used to be. Many homeowners are making their rooms look less cluttered and more spacious with easy-to-install, longer and wider plank flooring, available in materials like solid hardwood, luxury vinyl, and even tile. Today’s manufacturers offer many different kinds of products grown—and produced—here in the United States, making it a great time to remodel if you’re concerned about investing in USA-made flooring, whether you want hardwood, tile, laminate, or luxury vinyl. Mixing-and-matching is one style that’s here to stay. A bathroom tile backsplash that melds gloss with matte? No problem. A transitioning from hand-scraped hardwood in your family room to stain-finish tile in your kitchen? It’s a-okay. Gone are the days when everything has to be matchy-matchy. So, go ahead and make thoughtful combinations to create the look you want. Gone are the days when tile flooring was your only resilient, durable choice for areas with lots of moisture (and spills were likely). In 2019, homeowners have a wide range of water-resistant options in laminate, luxury vinyl, and even carpet. In 2019 and beyond, it’s going to be about personalization because customer service never goes out of style because it’s hard to be disappointed by your flooring investment if you choose distinct flooring that speaks to you (and suits your lifestyle, budget, and needs). All of which means—with so many choices on the market—finding the best solution for your project can be trickier than ever if you don’t have an in-depth knowledge of flooring products. That’s one reason why homeowners can’t go wrong by taking advantage of Kermans’ complimentary design service before they start any home remodeling project. The flooring design professionals at Kermans have years of experience, deep expertise, and a real passion for helping homeowners discover flooring that will transform their house into a dream home. Remodeling is a significant investment, and figuring out which flooring product best suits your project and its needs can be overwhelming. But, no challenge is too big for our team to tackle. Test us with your flooring design dilemmas, and we’ll provide you with the solutions you need—without pressure to buy you don’t.